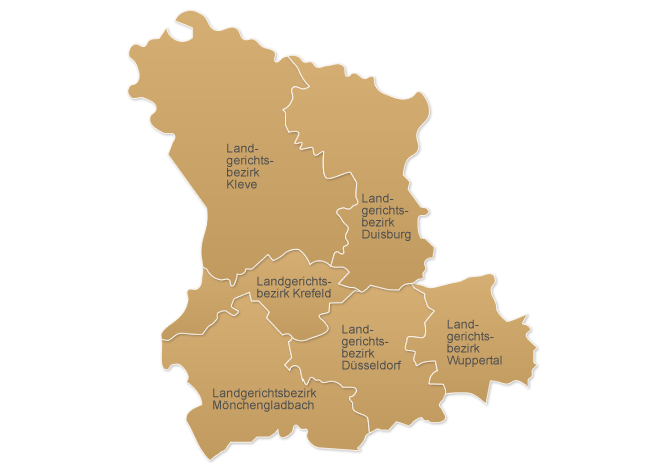 In addition to the Higher Regional Court districts of Cologne and Hamm, Düsseldorf is one of the three judicial districts in North-Rhine-Westphalia, and originated from the division of the court districts of Hamm and Cologne in 1906. Its 4.7 million inhabitants live in an area of approximately 5,000 square kilometers. 9 Divisions for Family Matters - "Düsseldorf Table"
The judicial district includes six regional courts and 29 local courts. More than 5,000 court officials, including approx. 1,000 judges, work in this district. The Higher Regional Court of Düsseldorf is the court of appeal for subordinate courts. In addition, it has special jurisdiction, e.g. in proceedings under the antitrust law, public pro-curement law, or cartel law. As the only court in North-Rhine-Westphalia, it is responsible for national security matters and terrorism proceedings. Over the past years, for example, Islamist terrorists have repeatedly brought before this court to answer criminal charges.